Not too sweet, no tart taste, just luscious red cherries in the summertime. 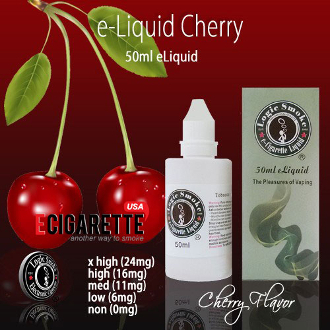 Our Logic Smoke Cherry e-liquid is a all-time fun favorite for vaping. Is great as a solo flavor, or mixes well with other fruit flavors. Also makes a nice enhancer with many of our different Logic Smoke cigar and pipe tobacco blends. Just add a few drops to your cigar or pipe tobacco flavored e-liquid and enjoy. With the perfect blend of an 80/20 PG/VG mix (propylene glycol and vegetable glycerin: organic, food grade preservative compounds), you'll get the best flavor concentration along with the perfect amount of vapor to satisfy your vaping needs.